Adams Media Corporation, 9781440528552, 304pp. Is it possible to navigate your own world of dreams? A practice rooted in Tibetan Buddhism, lucid dreaming is the ability to control dreams by becoming an active participant without waking. By lucid dreaming, you can explore your inner self, improve your creativity, fulfill your fantasies, and gain deeper spiritual insight. 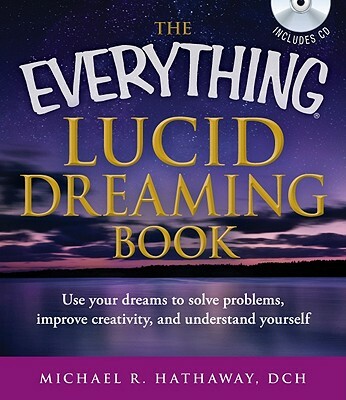 The guide includes an audio CD of guided meditations to prepare and relax your mind before sleep, plus space for keeping a comprehensive sleep journal. This complete package makes it easy for you to examine, understand, and even change the outcome of your dreams. Michael R. Hathaway, DCH, holds a doctorate in clinical hypnotherapy, is a Board-Certified Fellow of the National Guild of Hypnotists, and is a certified hypnosis instructor. He specializes in guiding people into altered states of consciousness, creating lucid dream like trances. The goal of this process is to provide insights for the subjects to make positive changes in their lives. Dr. Hathaway, director of the White Mountain Hypnosis Center in Madison, NH, has hosted a weekly metaphysical discussion group since 1994, and has more than twenty-five years of experience in consciousness and psychic research."